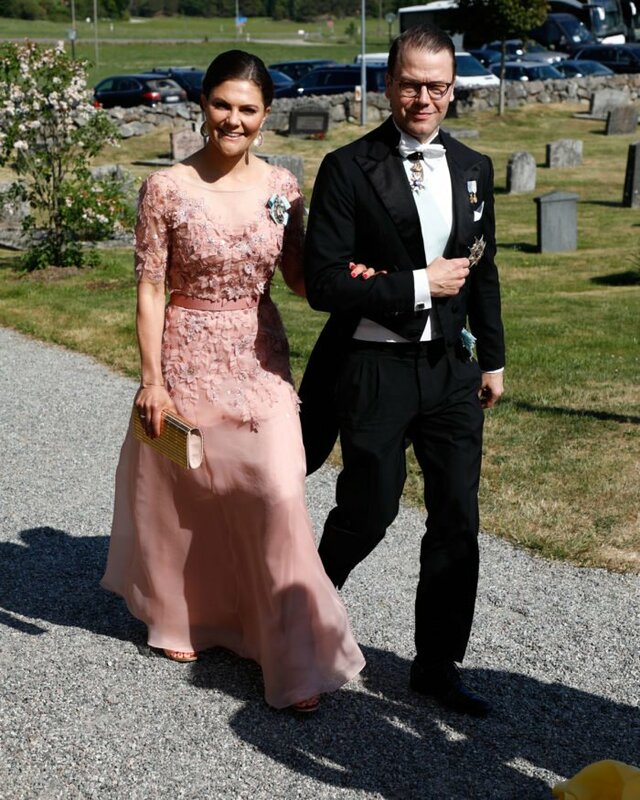 On June 2, 2018, King Carl Gustaf and Queen Silvia, Crown Princess Victoria and Prince Daniel, Prince Carl Philip and Princess Sofia, Princess Madeleine and Christopher O'Neill and their children Princess Leonore and Prince Nicolas, attended Louise 'Lussan' Gottlieb's and Gustav Otto Henrik Thott's wedding held at Hölö Church in Sörmland. 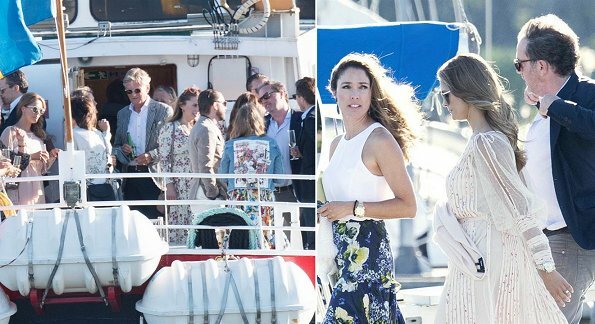 Louise Gottlieb is Princess Madeleine's closest friend. Everyone looks wonderful! I'm so happy that Louise finally found happiness. 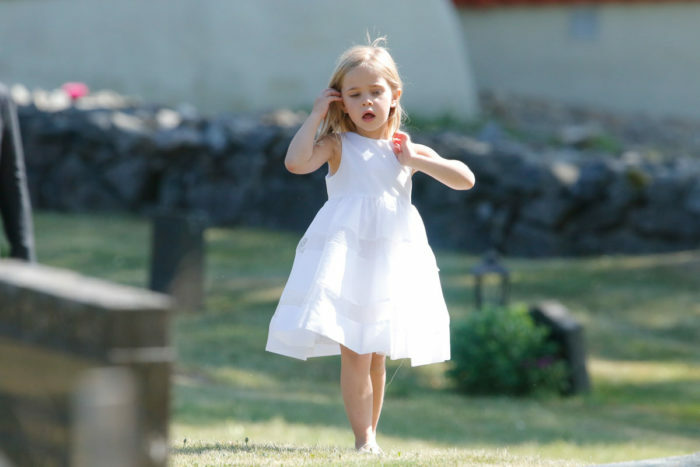 I wish I has so beautiful and textured hair that Madeleine has. Her hairstyle is always perfect, I just love it. Love her wedding gown. I am so glad that the strapless gown fad is just about over! So nice to see higher necks, sleeves and lace again! I agree, KarenAR, I also hope the strapless fashion are disappearing, and lesser cleavage will be on show. And I'm not only referring to weddings, but fashion at the horse races, and glamorous award evenings like Cannes, and Los Angeles. I was looking the other day on Pinterest, and there were a few commentaries, I "stumbled"on some vintages fashion, the portrait collars, etc, and if only this fashion can come back, I don't say we must use like crimplene again, we can still have it made in chiffon, and other cool material! Wow, Victoria and Sofia this time both look stunning! And also the bride looks beautiful. Hellen, only Leonore and Nicolas attended the wedding. Oh, what a beautiful day. Scandinavian summers are magic. 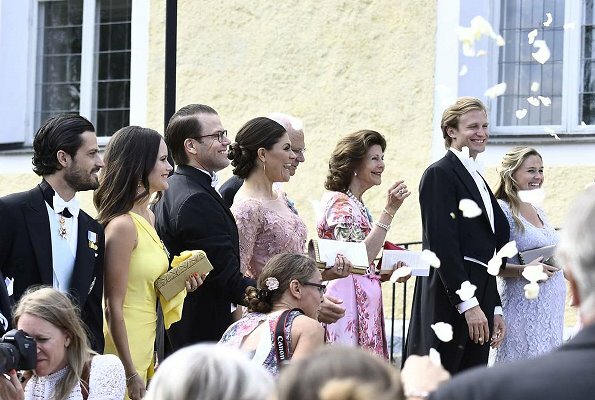 And the swedish royals love to celebrate the summer. 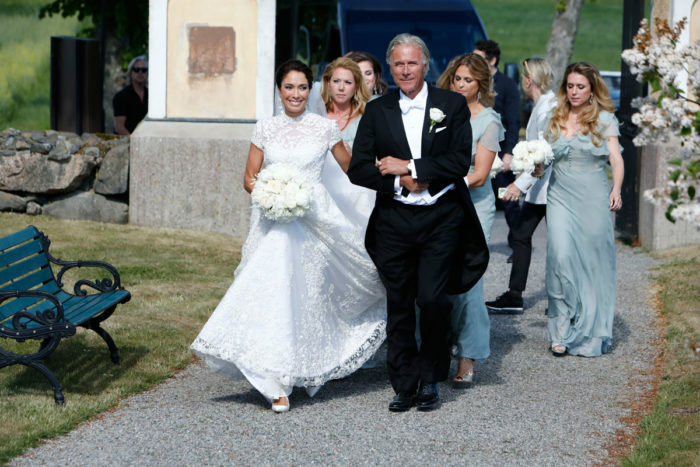 Honestly the bride's dress looks like a copy of Pippa middleton's wedding dress. Anyway she looks happy. Not sure of Victoria's dress is appropriate for a wedding. Perhaps for a royal banquet. Sofia looks good and appropriate even though that the dress looks a bit creased. Madeleine looks great! I find it nice the neutral pastel color dress. Her hair looks very nice too. Louise is also Leonore's godmother. Ooh, I love all the royal dresses, Sofia looks thin and curvy in her dress. A beautiful day. And, just for the record, it's not Holo - it's Hölö. The Royal Family all together Ladies and Men look great.I love men in a Tux always very classy,so do Ladies in Gale dresses. 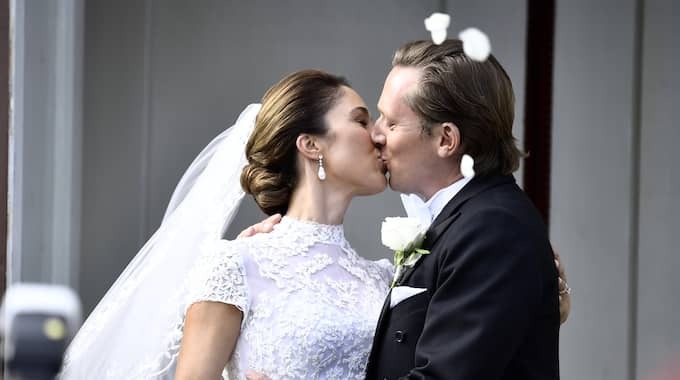 The Bride looks fantastic,beautiful dress.Pss Leonror and Nicholas have grown so much. Hope everyone had a super day.The best to the Bride and Groom,for their future. Silvia and Victoria look beautiful. Their dresses are quite regal. Do not care much for the banana yellow dress on Sophia. Wish we could see a front facing pic of Madeleine. Her hair looks wonderful in the bridesmaid pic. I agree that The Queen and the Crown PRincess look wonderful. Sophia could have used less of "a leg show". Not fond of the bright yellow and her long tresses/extensions. The bride and all royal ladies look so pretty. Best wishes for the newlyweds. Did they get married in a cemetery?? Do you live beyond the moon??? Strange question. Not strange at all. There are graves there. I came to understand that its a church with a cemetery. In Scandinavia most of our (at least older) churches are with cemetery. Most of times you only get to church by walking path in the middle of graves. Thanks Blondiini and Raquel for your answers. Anonymous, hiding your name so you can write obnoxious comments meh! Churches are often surrounded by a cemetery. What a question. Best look for Sofia. And general opinion or not, the bun is Victoria's signature look for official events. It doesn't look like it's going to change in the next future. Personally I prefer the ponytail to her. I love that silver dress on unknown woman. I belive she is the mother of the bride. I agree she looks fantastic. She is the brides mother, I like it too. 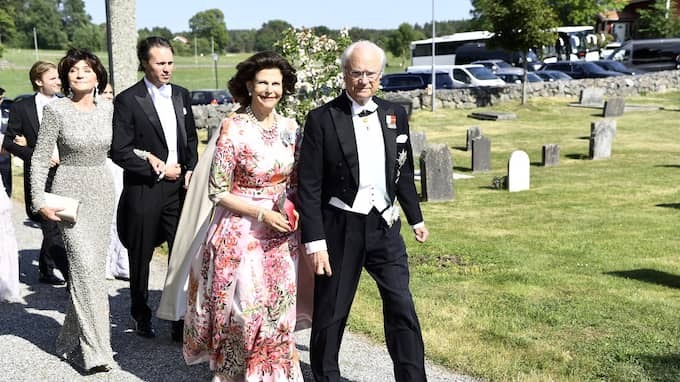 I think all the royal ladies look good, especially queen Silvia. 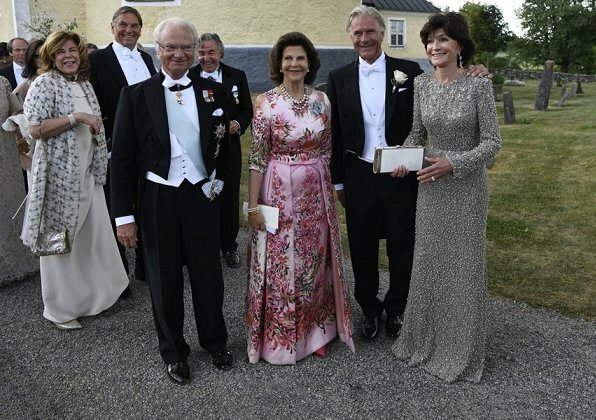 Beautiful dresses on Queen Silvia,Victoria and Sofia ……… even though, it doesn't look like they are invited to the same event/wedding! I like Madeleine's lovely pre-wedding party dress too ……… but not so much her bridesmaid dress. Sofia and Silvia look so pretty. Silvia is 74 but still has great body, her dress looks perfect for the wedding. Sofia's yellow dress is lovely (sans those wrinkles). Loved her soft curls. Victoria's dress look too fancy in my opinion, like she wanted to emphasise that she's important crown princess but instead looked out of place. Madeleine's dress looks lovely. Loved her hair. She has stunning hair, just like her mama. They a look so good and happy. Especially Silvia and Victoria look so good. Must have been nice weddings.